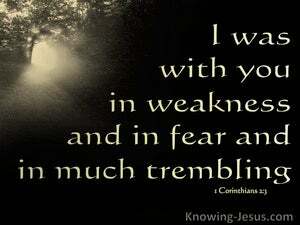 And I was with you in weakness, in fear, and in much trembling. It was in weakness, fear, and great trembling that I came to you. And I was in ( passed into a state of) weakness and fear (dread) and great trembling [ after I had come] among you. And I was weak, apprehensive and fearful when I was [there] with you. [Note: This probably refers to Paul's sense of inadequacy in view of the task before him]. And I was with you without strength, in fear and in doubt. I was with you in weakness, and in fear, and in much trembling. 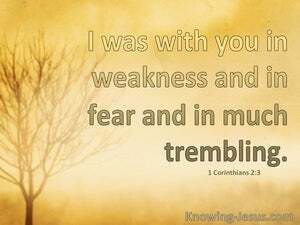 And I was with you in weakness and in fear and in much trembling. And I, in weakness, and in fear, and in much tremor, was with you. 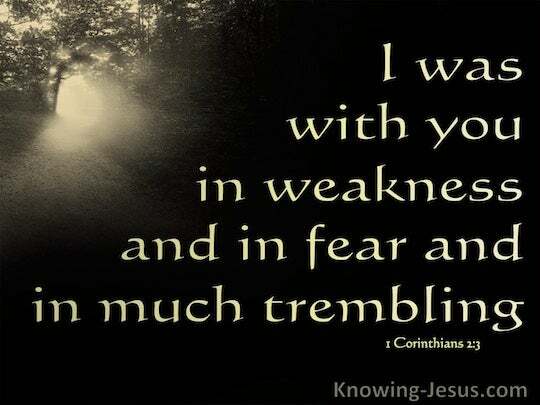 And I was with you in weakness and in fear, and in much trembling. And I was among you in weakness, and in fear, and in much trembling. In weakness and fear and great trembling came I among you. And I was with you in weakness and in fear and with much trembling. When I was with you, I was weak and afraid and I shook. And in weakness, and in fear, and in much timidity, was I among you. Indeed, when I came among you, I was weak, and full of fears, and in great anxiety. And so far as I myself was concerned, I came to you in conscious feebleness and in fear and in deep anxiety. Who is weak without my being weak? Who is led into sin without my intense concern? On behalf of such a man I will boast; but on my own behalf I will not boast, except in regard to my weaknesses. After these things he left Athens and went to Corinth.